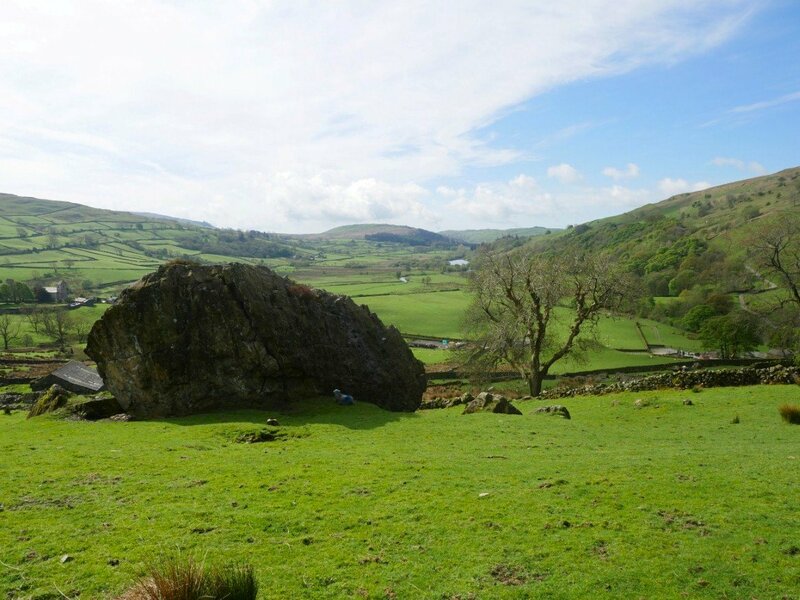 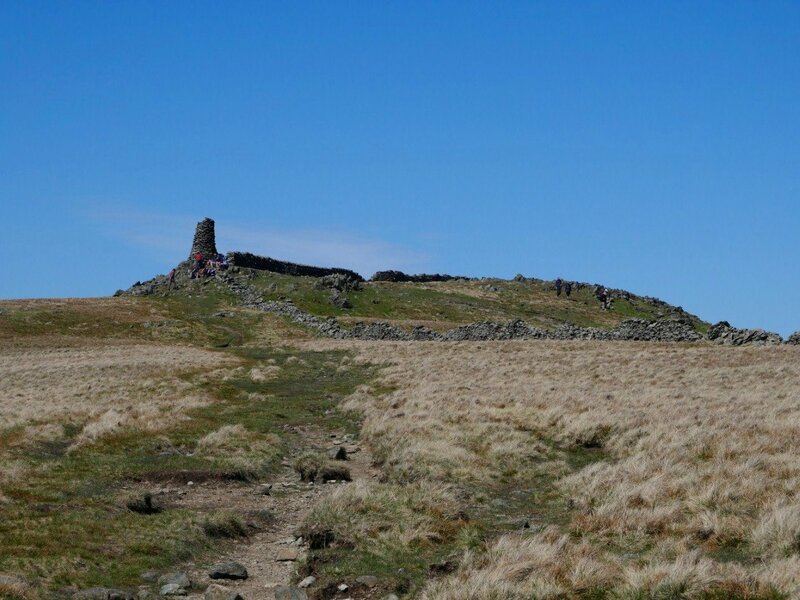 A perfect day to walk an old favourite this week. 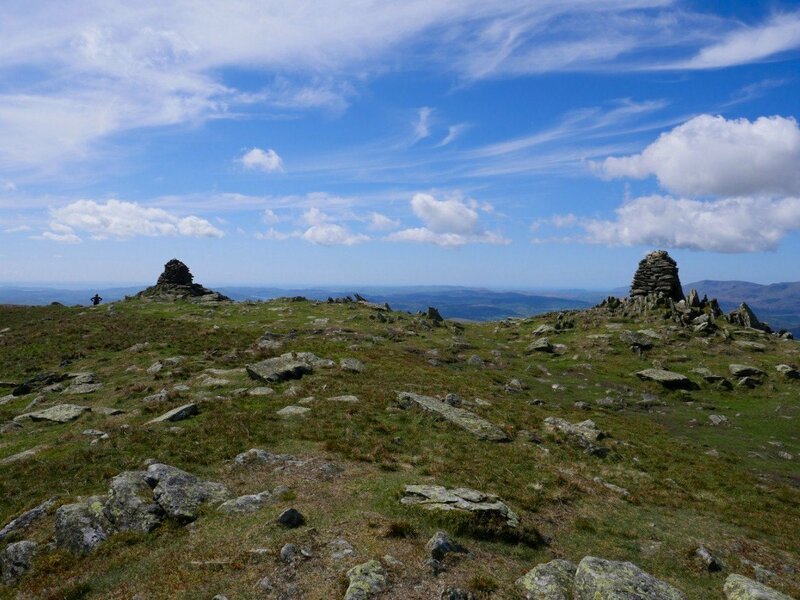 We visited the eight Wainwright tops on the round as Mark was with us and wanted to add to his Wainwright total. 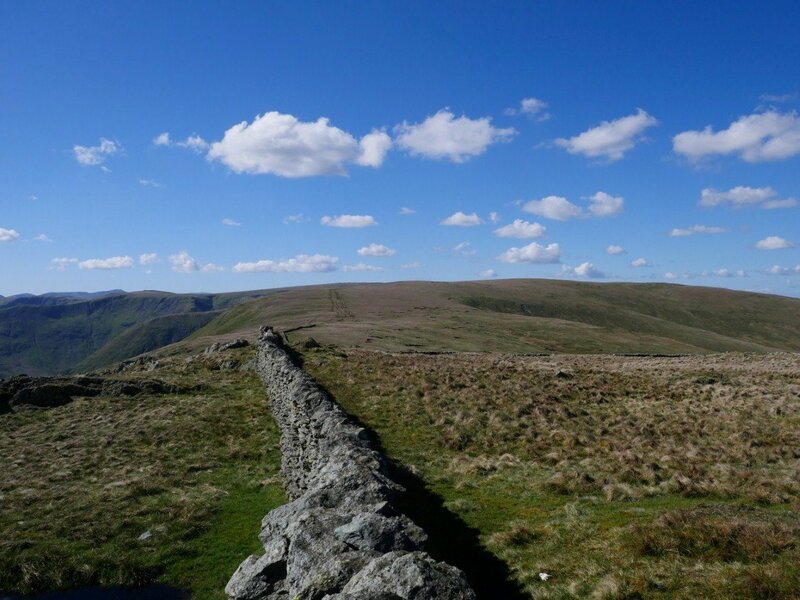 A look over the wall to the top of Garburn Pass. 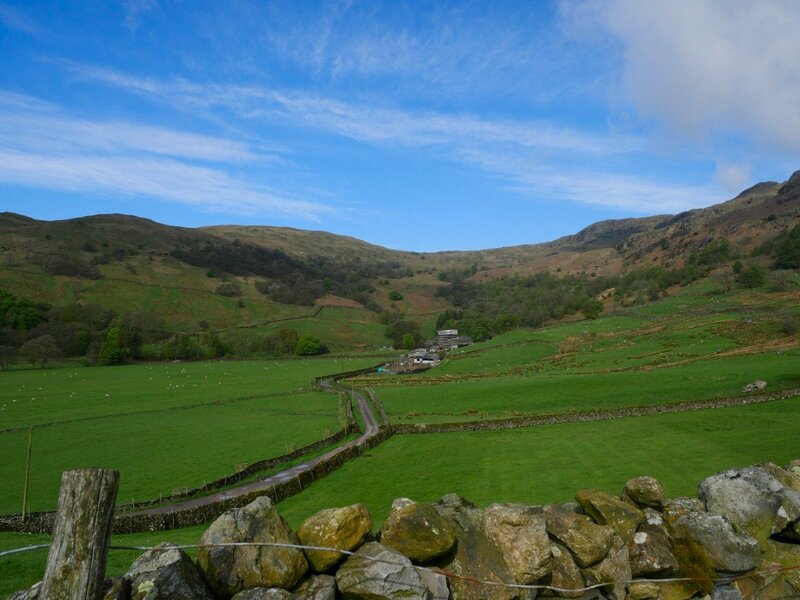 They are still working on Kentmere Hall. 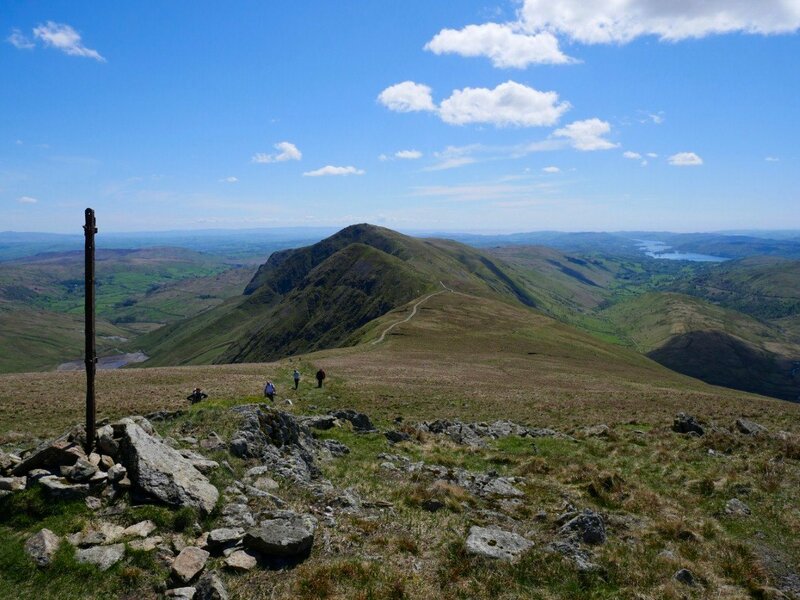 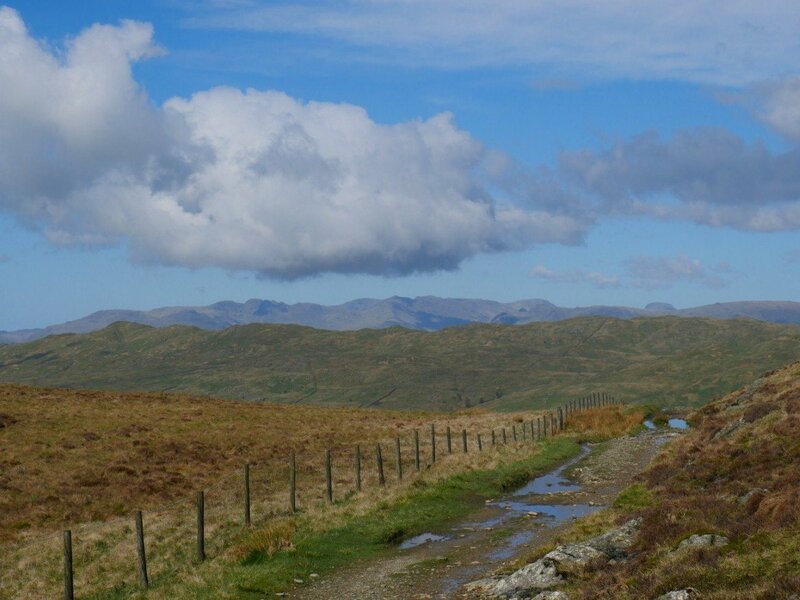 Kentmere from near the top of the pass. 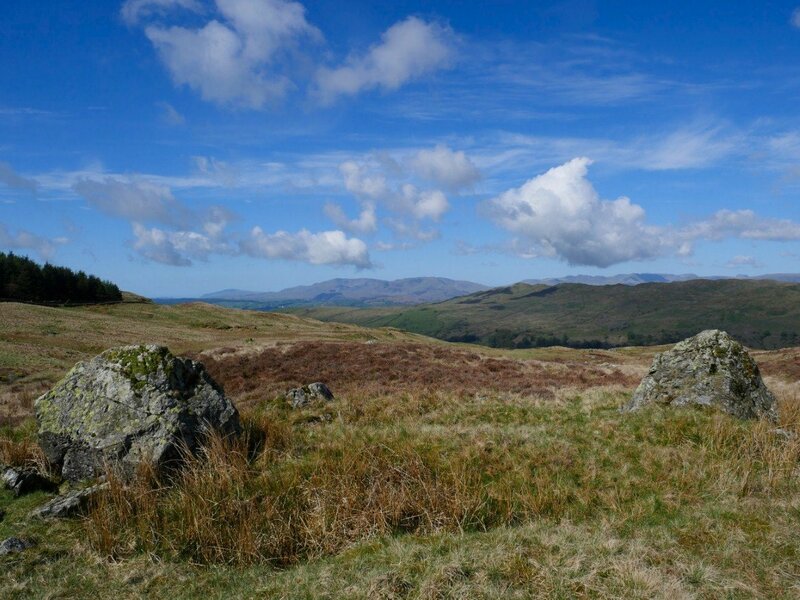 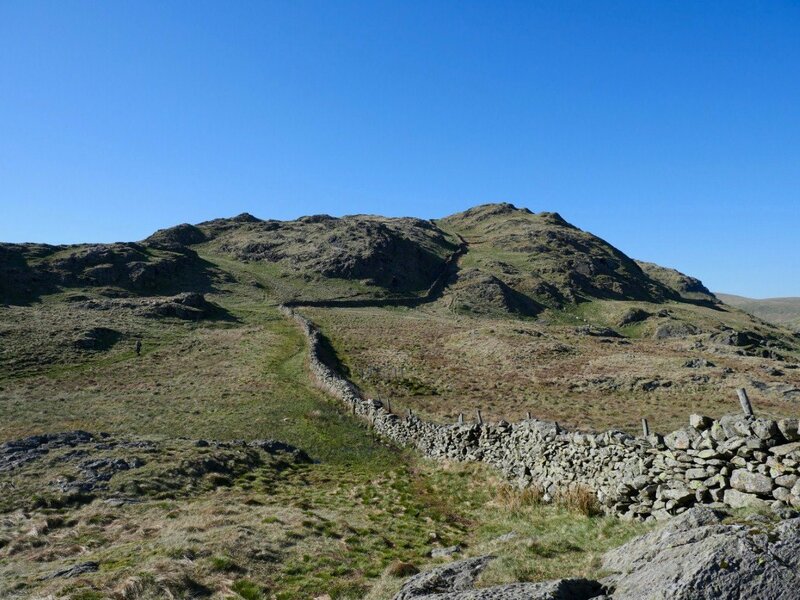 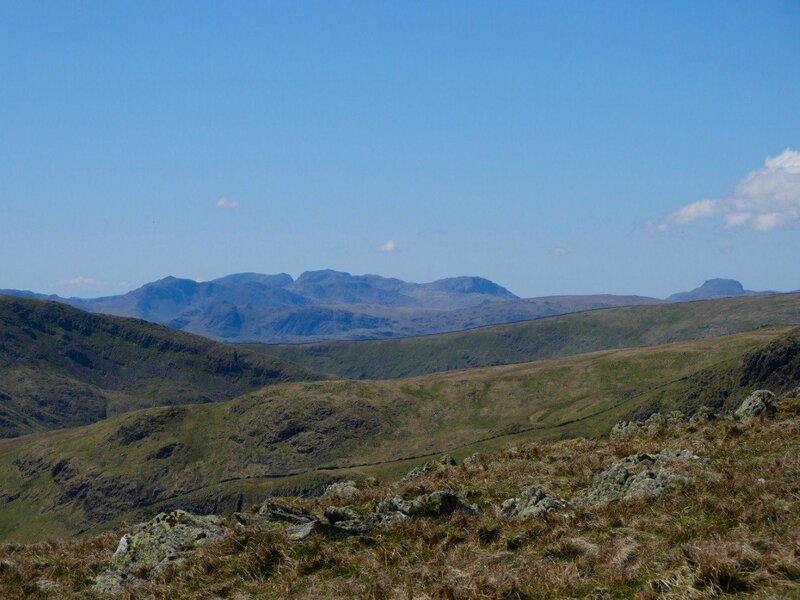 Not much haze about today so really clear views over to the high fells to the west from Coniston on the left to the familiar shape of Great Gable on the right. 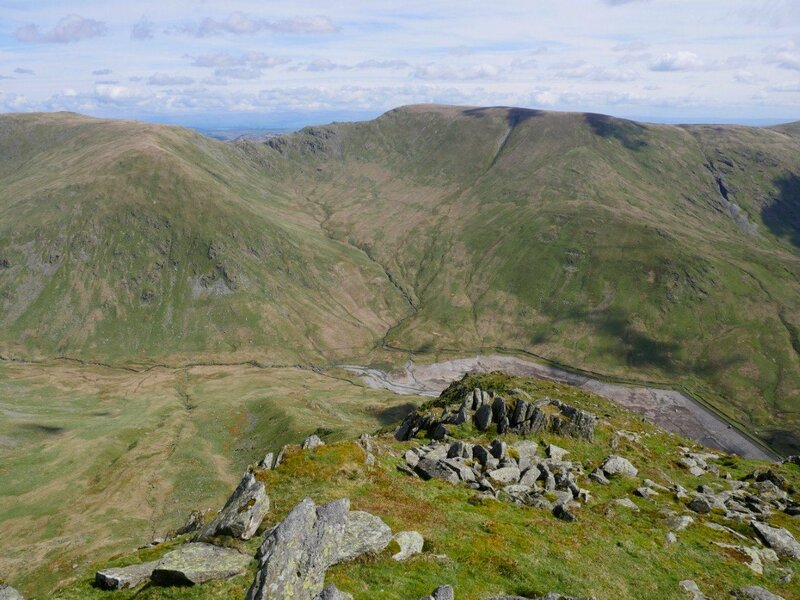 The view a bit more to the south west showing Black Combe. 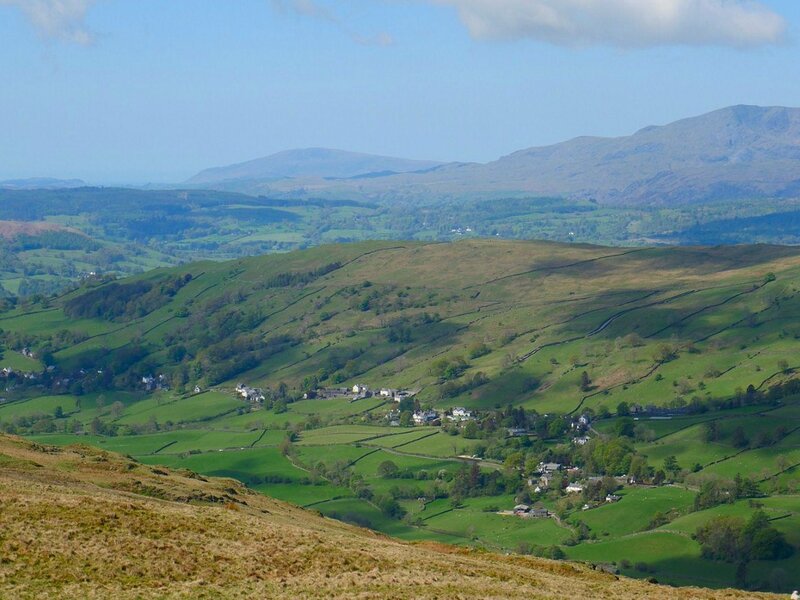 Troutbeck village in the valley below..
Our onward route from the climb to Yoke. 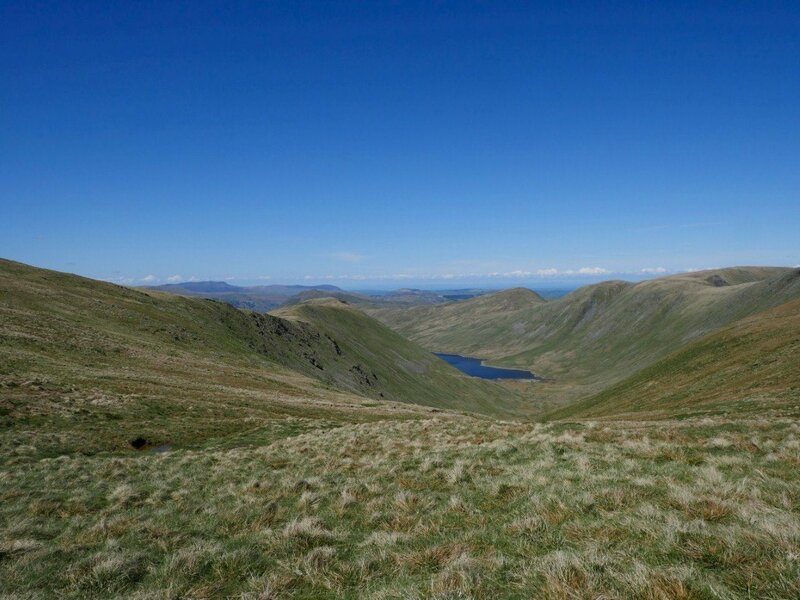 A bit of a surprise to find Kentmere reservoir empty. 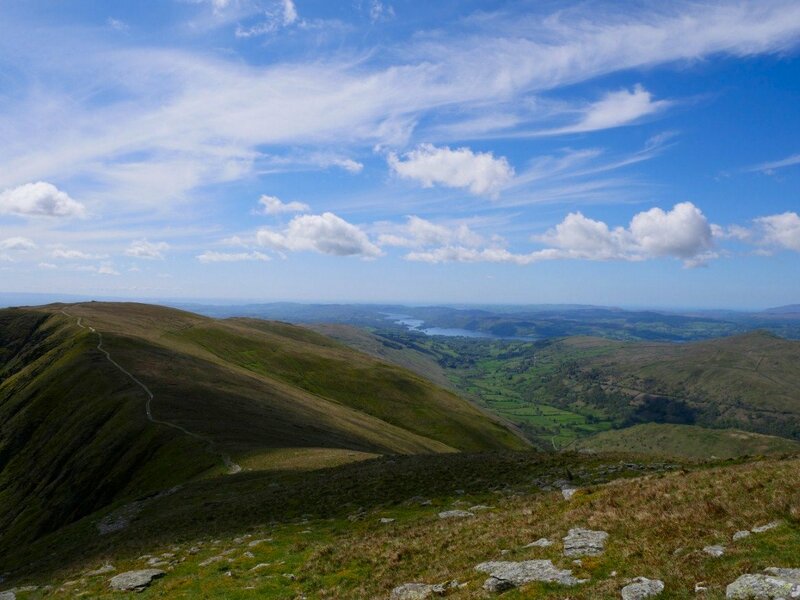 I have had a quick google search but can't find any information on why this is..
Windermere from the climb to Ill Bell. 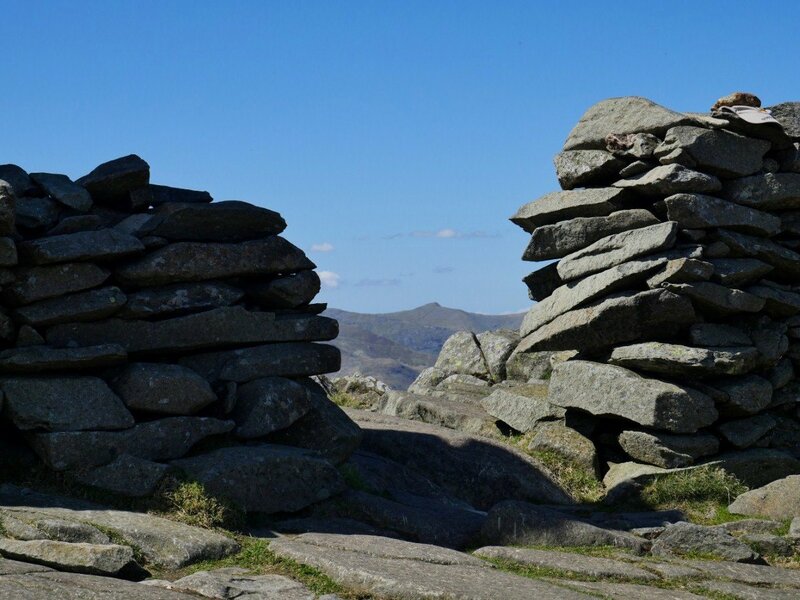 Back down to two cairns on Ill Bell. 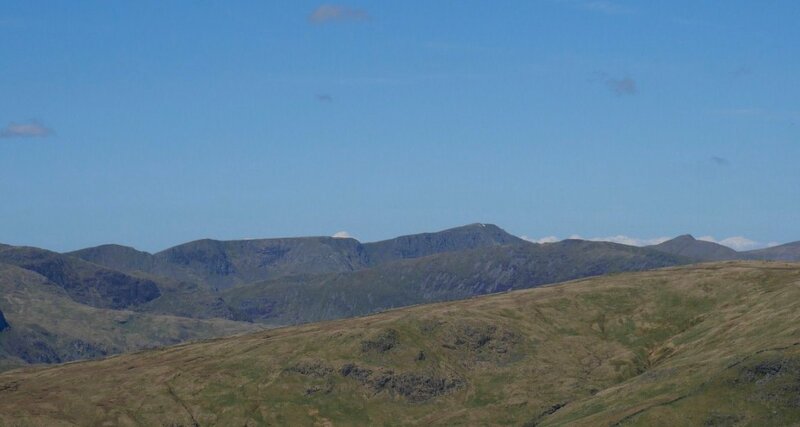 Looking across to Nan Beild and Harter Fell from the top of the north east ridge of Ill Bell..
A tiny bit of snow still on Helvellyn. 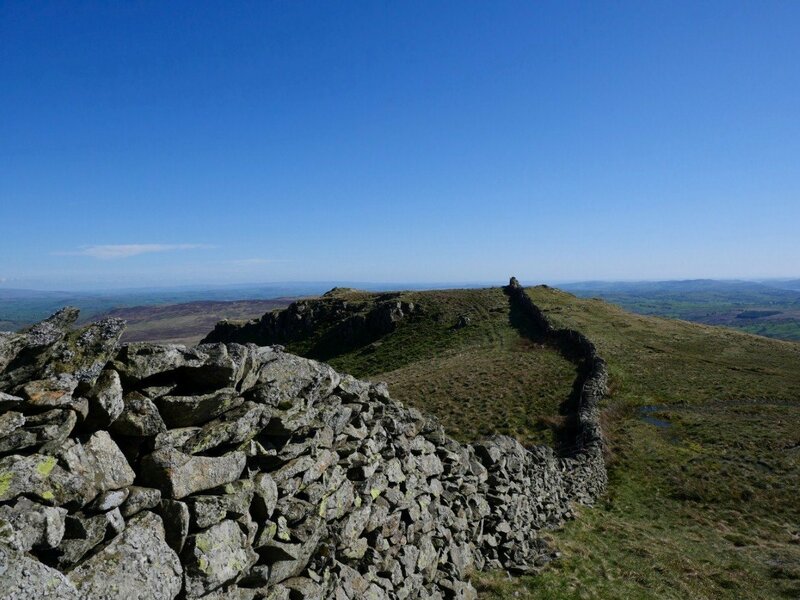 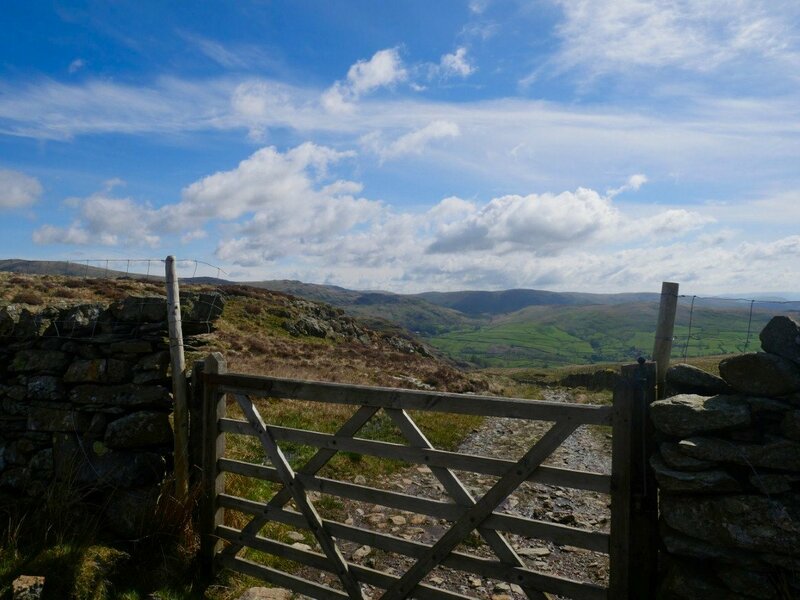 The three fells so far climbed from the final pull to Thornthwaite Crag..
Catstyecam through the wall on Thornthwaite Crag. 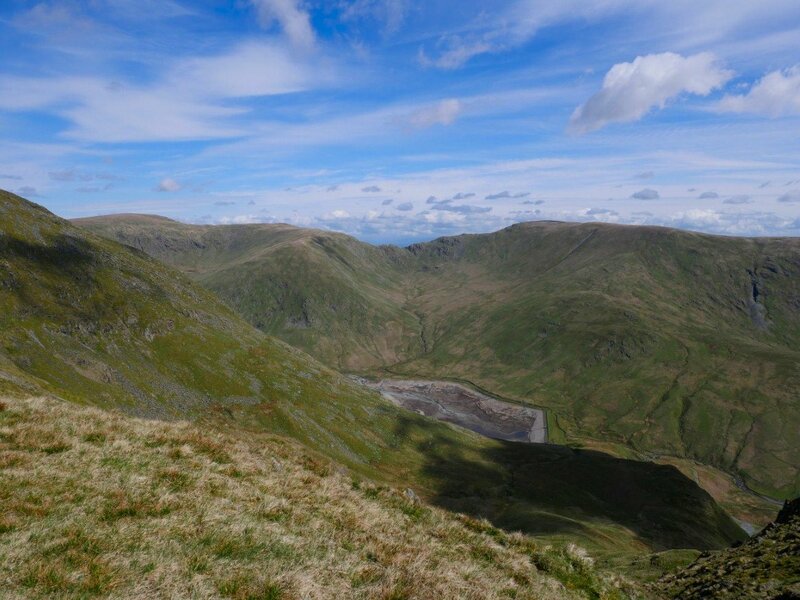 Hayeswater flanked on the left by Gray Crag and High Street and The Knott on the right. 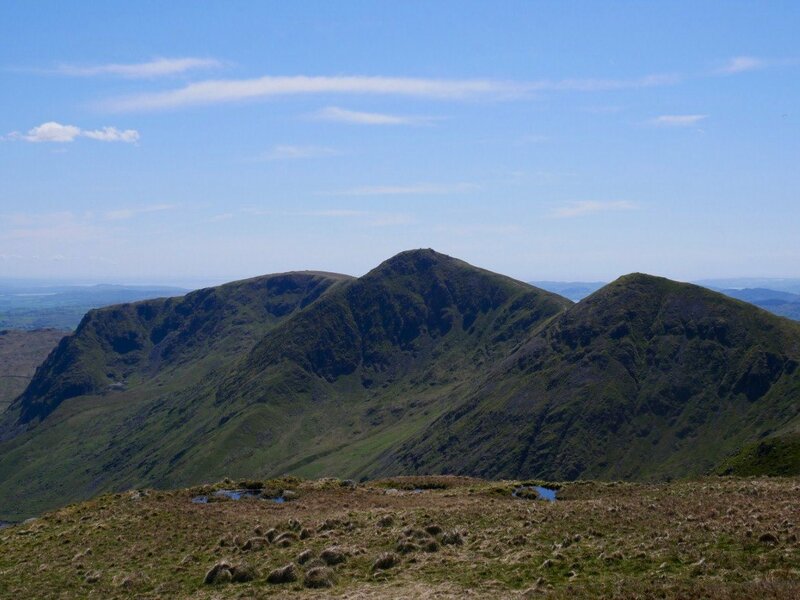 The three fells of the left leg of the horseshoe. 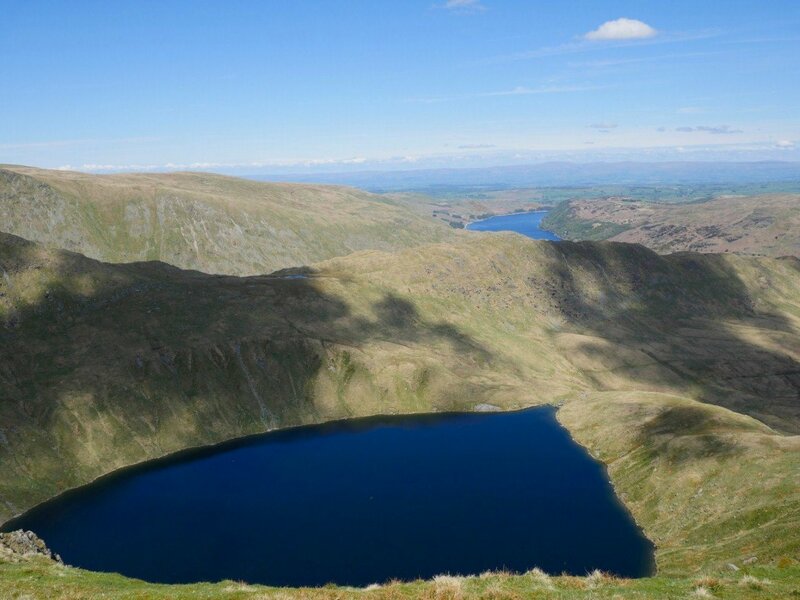 Really nice blue colour to the tarns today. 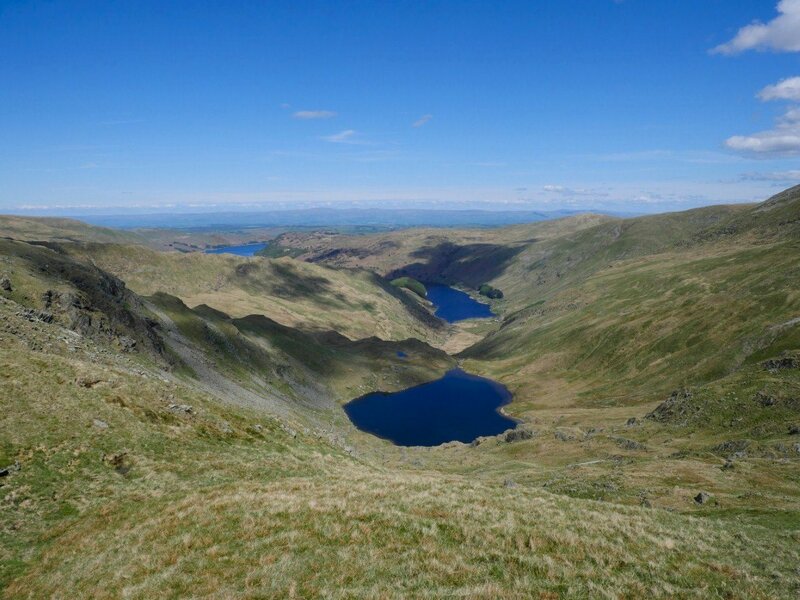 This is Blea Tarn from Mardale Ill Bell. 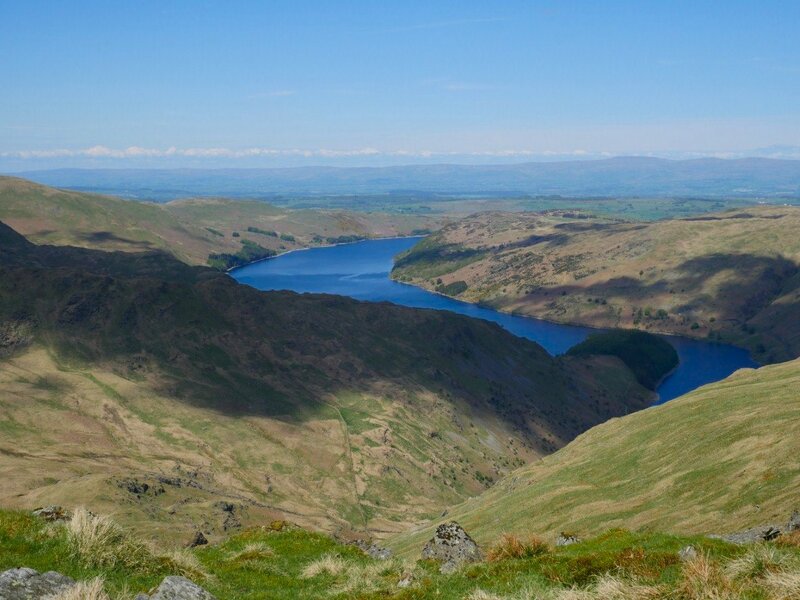 More of Haweswater and the trees on The Rigg appeared on the climb from Nan Beild to Harter Fell..
And looking back to Harter Fell from Kentmere Pike. 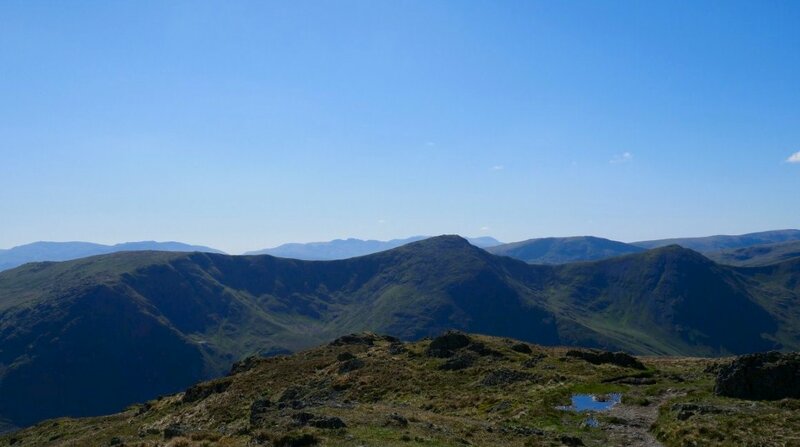 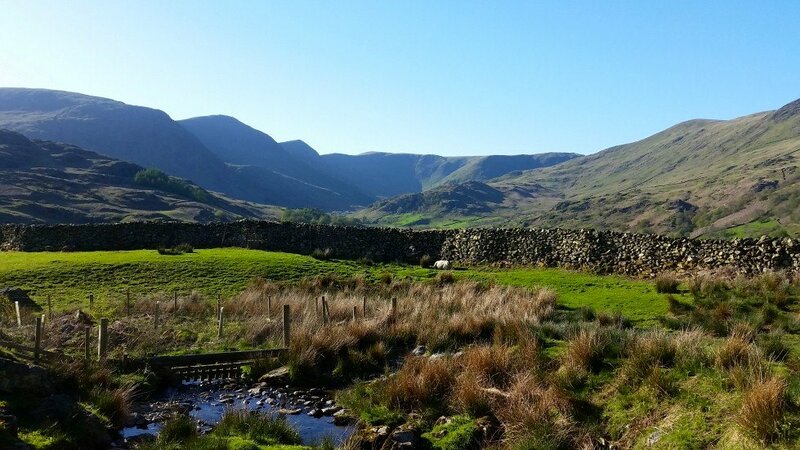 View over our outward leg to the fells to the west. 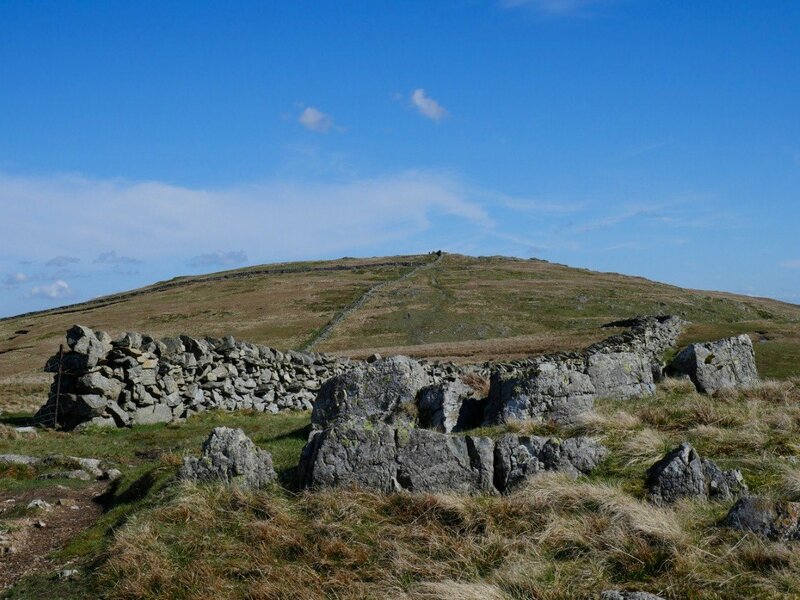 Just the little bump of Shipman Knotts to climb now. 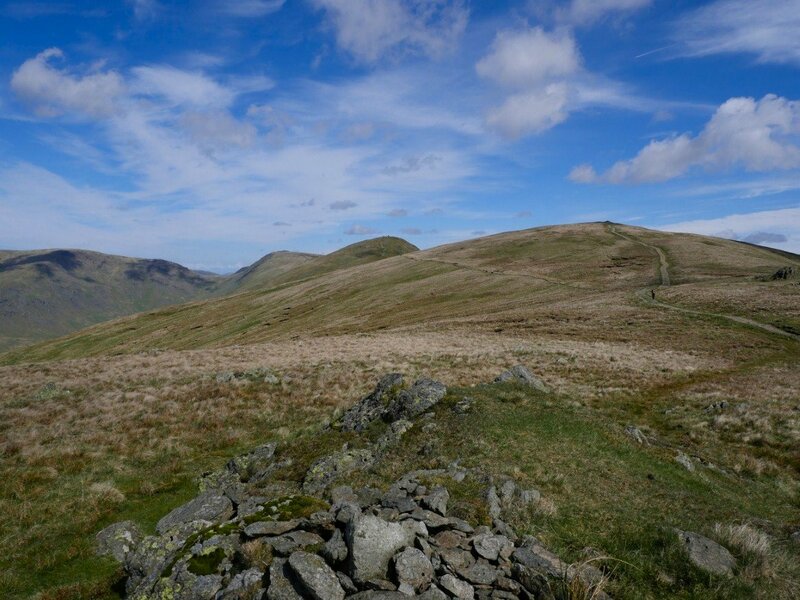 I'd forgotten to charge my camera battery fully and it just didn't make it so this wide picture of the horseshoe is from my phone.